Point of care (POC) tests are rapid medical diagnostic tests designed to be carried out next to the patient. POC devices produce results much faster than laboratory tests which enable physicians and nurses to act sooner and thus save lives, improve patient outcomes and reduce overall costs to healthcare. However, more widespread use of POC testing is currently limited by the sensitivity of current devices. 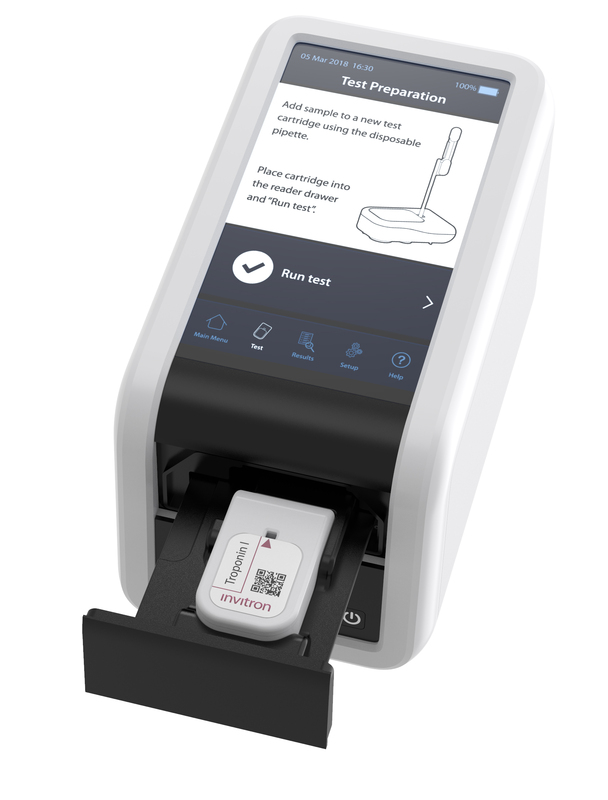 Invitron is developing a POC test system using high sensitivity chemiluminescent compounds that will enable low cost, portable POC devices to achieve the analytical sensitivity of laboratory analysers. Utilising acridinium ester (AE) chemiluminescence detection, this system has been designed specifically for applications that require extremely high levels of analytical sensitivity. The device can accept various sample types, including whole blood and plasma, which are placed directly into the inlet of a single-use disposable test cartridge. Typical sample volumes are in the range of 10 – 100µl and test times in the range of 2 – 15 minutes. The portable immunoassay reader features temperature controlled incubation, adjustable mixing and a full assay wash cycle (up to 4 washes). Accurate quantification is achieved using highly efficient optical detection.